Why Service With Peoria Toyota? 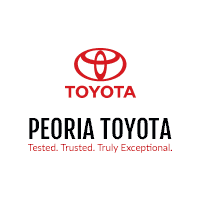 If you aren’t sure where to get Toyota service in Peoria, IL, schedule Toyota maintenance at Peoria Toyota and enjoy convenient Toyota repairs. The highly trained and tenured team at our locally-owned Toyota dealership in Peoria, IL, has treated Central Illinois drivers to quality Toyota maintenance and repairs since 1980, and has over 40 years of experience performing exceptional auto repairs. Taking care of you while we take care of your car is our passion and has led our Toyota service center and dealership to win the prestigious Toyota President’s Award every year since 2010. Your car is in good hands when you schedule Toyota service with Peoria Toyota, so visit us today to get a Toyota oil change or tire rotation! If you live in the Heart of Illinois, we know your time is valuable. That’s why our Peoria Toyota service center doesn’t look to waste a minute of it. We offer a fast and convenient Toyota Express Maintenance lane to help get your Toyota in and out of our service bays quickly. You can get a Toyota brake inspection or wheel alignment done in half the time and be on your way. Our Toyota service center stays open later than the competition, providing both extended weekday and Saturday service hours. We even go the extra mile to post our Peoria Toyota service menu online, so you can know exactly how much your Toyota service and repairs will cost. Peoria Toyota is Tested. Trusted. Truly Exceptional. Book a Toyota service appointment online and come see for yourself! Looking for More Reasons to Service at Peoria Toyota? Don’t want to wait for your Toyota maintenance and repairs to be done? Take advantage of our courtesy shuttle service or one of our available loaner cars! If you need to bring the kids with you when your Toyota is being serviced, come pass the time in our newly remodeled kid’s play room and spend time with your family. We don’t want your auto repairs to slow down your day, so allow us to help you get some work done in our Wi-Fi equipped Business Center. You can treat yourself to complimentary coffee, cappuccino, espresso, water and fresh-baked cookies, too, when you visit our Pearl Café! Our Toyota service center has drive-in service! Simply pull in when you need a Toyota battery replacement or brake pad inspection and our Toyota service team will handle it. We love helping Peoria drivers save, so we offer competitive Toyota service specials and Toyota parts coupons to reduce the cost of your auto maintenance and repairs. We employ Toyota parts specialists who use OEM Toyota parts to customize or repair your car!